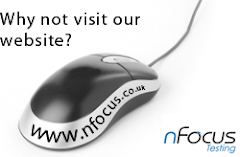 nFocus Blog: Content Management System Applications within Media sites: What does this mean for testing? Content Management System Applications within Media sites: What does this mean for testing? With the growth of Content Management System (CMS) applications within the media sector to deliver rich content to their web applications, media companies need to consider what sort of testing is required when using CMS applications to manage rich content. The area considered here looks at integration between the external feed of data, the CMS application and the overall web platform. 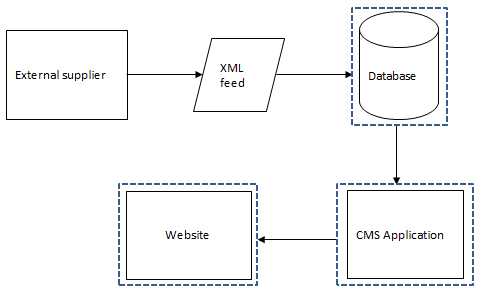 An example of a workflow used by a media site using CMS to manage content is illustrated below. 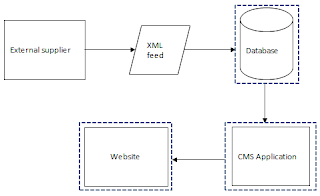 Validation to ensure that XML feed contains data required by the user. Tests to ensure XML feed is successfully imported into the CMS database. Test CMS application to ensure data with all fields are received. Manage content within the CMS app and verify rich content is displayed on the user facing web app. There are various methods that could be considered when testing in this particular scenario. Two methods include the use of equivalence class partitioning to test a subset of the data or using automation to cross check all data. As equivalence class partitioning can always leave room for error if the different XML feeds contain different data, a better approach in this scenario would be to automate the process. What would an automated test be required to do? Parse the xml to find the feed data and cross check them against the data fields required by the user. This in turn ensures all required data is present within the feed. Verify that the feed does not contain any duplicates. Where images are present in the feed save all of the image URLS and collate them into a HTML file and open in a web browser to verify that there are no image URLS that produce 404 errors. This approach would be useful if there was a need to check that the correct image is displayed. However this could also be implemented programmatically without the need to launch a browser.